As you’ve probably noted, we have a thing for Shelby Mustangs. There isn’t a more classic American muscle car out there. 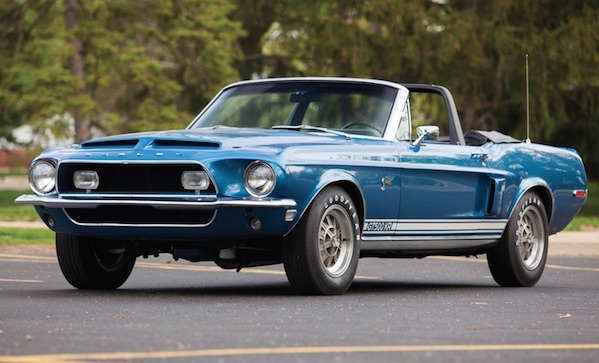 So you know we’re going to be interested in this 1968 Shelby GT500 KR Convertible no matter what, but get this: Carroll Shelby himself owned this car. That’s right, in 1996, Carroll Shelby acquired this GT500 KR for his personal collection, restoring to what we can only imagine are the highest standards going, because Shelby comes correct. Other fun facts: it packs a legendary 428-inch Cobra Jet V-8 engine, pulls 335 bhp, has a three-speed heavy-duty C6 automatic transmission, independent front suspension, coil springs, and a live rear axle.